Step into your local supermarket and take time to look at displays. There are so many different brands of free standing display unit. Kinder, one of the chocolates we love, has a special egg-shaped like design packaging. To stand out from market competition, Kinder used custom POP display to further differentiate their brand from the rest. Compared with brands which are placed on the shelves, a custom POS display has more chance to grab everyone’s attention. People can select the product from the display. You are already thinking about opening the egg and playing with a toy. Before going into more detail on Kinder and their display, lets revisit some old blogs with a similar concept. What I really love about this one is that the display reminds me of Nesting Dolls. You could apply this to other packaging too. What Makes Kinder Joy grab everyone’s attention? Kinder’s display is unique. Its egg shaped design is same as the packaging of Kinder’s product. The brand image has been impressed in the customer’s mind. Thus, when a customer sees the POP display unit from afar, they will immediately know what brand it is. Plus, the logo placement is good with large logo printed on the rack. POP display unit is big. Merchandisers can put more products in custom POP display because they can customize the size and shape according to their needs. Profitable – Kinder’s POP display is made of good quality materials. Thus, it is easy to maintain and can be reused for future marketing projects. Visibility– Using the familiar colors trademark of Kinder to build brand awareness is a great strategy. It is effective to use brand colors because it makes it easy for customers to identify the brand image. Strategic Location– Since it is a free standing display, it can easily move to indoor or outdoor. The brand display unit can be set along the busy aisle of the department store. 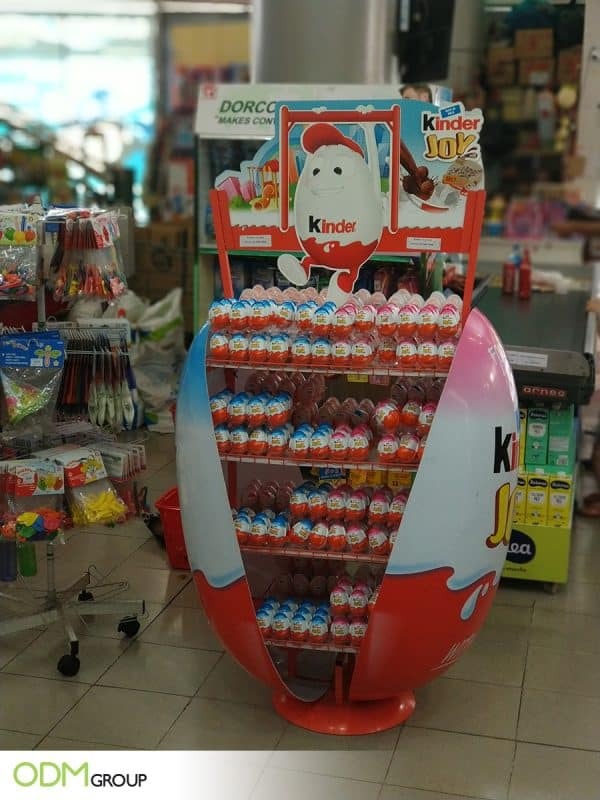 When people in the payment queue noticed the unique POP display, they will not forget to purchase a Kinder product. POP displays are very common in retail stores. While every brand is doing the same marketing tools, why not have your very own custom POP display? Custom POP display make your brand look different from other brands! If you are interested in creating custom POP display for business, feel free to contact us anytime. ODM has the right people to provide you a high quality designing, sourcing, and manufacturing of promotional gift and other marketing tools. This blog discusses how LAska was able to promote their gift with purchase product through a custom POS display.